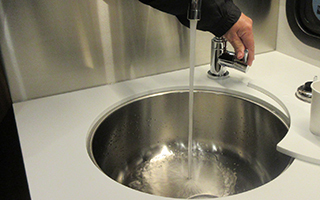 In order to keep your drinking water tasting fresh and clean, your plumbing system needs to be kept the same... To do this, you should consider sanitizing your plumbing system at least once a year to keep everything running smoothly. 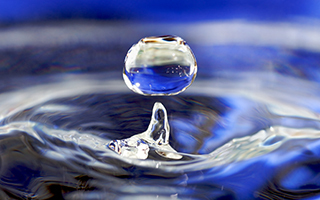 Note: A city water connection is not required for this process, but is recommended so to not waste too much water. 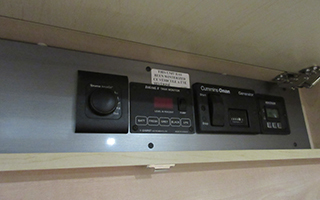 Step 3: If you have a Unity or Serenity model, remove the water filter from the housing by using the water filter wrench supplied with your unit. The Wonder does not come equipped with a water filter. Reattach the housing once filter is removed. 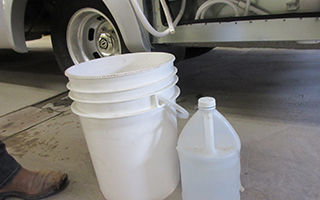 Step 4: At the utility center on the exterior of the coach, set your winterize valve (1) to "Winterize" and your water fill selector (2) to "Water Tank Fill Only"
Step 5: In a separate container, mix 1/4 cup of bleach for every 15 gallons of water to fill the tank, or a 1:960 ratio. 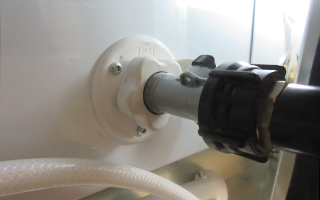 Step 6: Insert the end of the winterize hose in to the bleach/water mixture and turn the pump on. 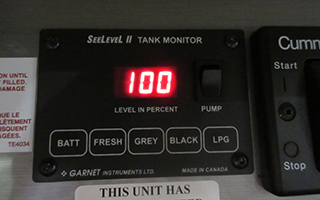 Step 7: Continue to fill the fresh water tank with the bleach/water mixture until the monitor panel shows it as full, or you see water coming out of the fresh water overflow. 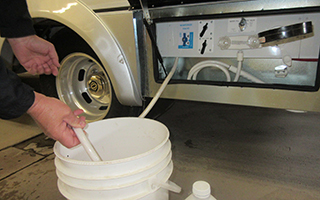 Step 8: Once the fresh water tank is full, turn off the pump and remove the hose from the container. 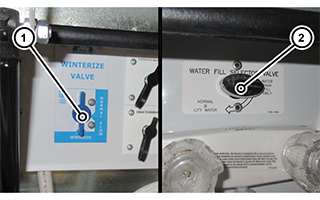 Set the Winterize valve back to "Normal Flow". 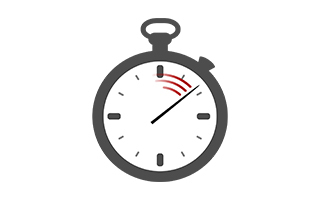 One at a time, turn on all of the taps (Galley, Vanity, Shower, etc...) and allow water to run through for a few moments to allow the bleach to enter the lines. Step 9: Let the mixture soak in the tank for approximately 2 hours. 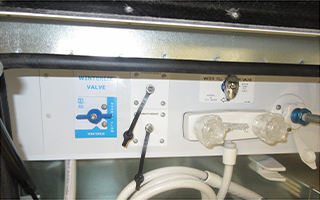 Step 10: Once the 2 hours is up, set the Winterize and water fill valves to their normal operating positions. 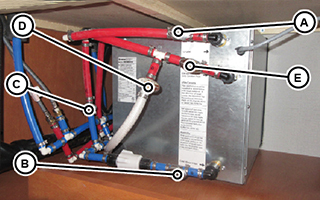 Step 11: Inside the unit, turn on all of the faucets to allow the water to drain from the fresh water tank and enter the grey and black tanks, as well as flush the water lines. Step 12: Once the fresh water tank has been drained, dump the grey and black tanks, and refill the fresh water tank with clean water. 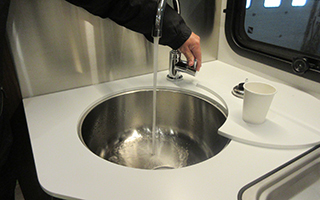 Step 13: Once the fresh water tank is filled, run through the process of draining it through the galley and vanity faucet to ensure the lines are flushed. 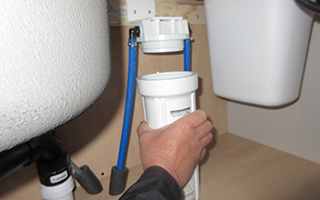 Step 14: Once flushed, set your hot water tank back to normal operating position and replace the water filter removed earlier. Step 15: Refill your fresh water tank. Your water system is now sanitized and ready for use!